What is genetic eye disease? Genetic eye diseases lead to visual impairment either through malformation or early functional loss of the eye. They affect the quality of the retina, the light-sensitive film at the back of the eye. A large majority of these diseases are essentially characterised by a gradual deterioration of sight. Leber Congenital Amaurosis (LCA) is one of those genetic eye diseases. In 1869, Theodor Leber, a German ophthalmologist described LCA in affected children of the same sibship born to healthy parents. LCA is an inherited retinal dystrophy, with many subtypes, with an onset either from birth or within the first few months of life. All types of LCA are progressive, eventually leading to blindness, but some progress more rapidly than others. 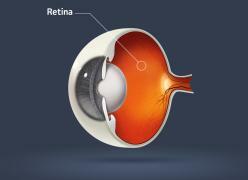 LCA can be seen as the childhood form of Retinitis Pigmentosa (RP), a family of hereditary diseases. They are characterized by a progressive retinal degeneration leading to night blindness, tunnel vision and eventually often loss of central vision. This is relevant as some treatments for patients with RP may also be suitable for those with LCA and vice versa. Inherited diseases are caused by mutations in specific genes. A mutation leads to disruption of the code of a gene, leading to the production of either a bad protein or none at all. Mutations in one of many different genes may lead to LCA, RP or any other inherited retinal disease. What therapies are currently available? As mutations in genes cause LCA, gene therapy is a logical treatment option. Gene therapy has recently been used to effectively treat one variant of LCA. The treatment uses eye surgery to insert a good copy of the defective gene into the retina of LCA patients. Over the last few years, scientists and patients alike have seen very encouraging progress using this form of treatment. Indeed, young patients who have undergone this procedure are making significant progress with improved eyesight, and they can expect further degeneration to be halted. However, this treatment is currently only available for one subtype of LCA, and should be performed at a very young age. Hence, there is no treatment for the majority of LCA patients at this moment. What future therapies are likely? So far, gene therapy is the area of research and treatment to have yielded the most promising results. Pharmacological treatment is also a therapeutic option under scientific investigation. This involves the use of drugs to slow down the degenerative process. In some cases drugs can even improve sight and would certainly mean many more years of functional vision for LCA patients. Experiments on animal models of these diseases have shown promising results. Ocular cell transplantation is another area of research. As retinal photoreceptor cells are impaired in the majority of inherited retinal diseases, the idea is to replace them by cell grafts from a healthy donor eye. Research is in its very early stages, with only partial success in animal models, but there certainly is a potential to develop this approach into a proper treatment. Stem cell therapy is also promising in this area. Stem cells are found in embryonic tissue, and have the theoretical potential to develop into any kind of body cell. The basic idea in the case of LCA is that stem cells could be used to help replace existing dead photoreceptor cells or even restore the entire retina in case of advanced degeneration, thus restoring sight. However the mechanism by which the stem cells can be transformed into a fully functional retinal cell such as photoreceptor cells, still needs to be fully understood. Hence, there is still a long way to go before this approach can be developed into a clinically applicable treatment option. These two clips show the remarkable progress of a young boy, Corey Haas, after undergoing gene therapy for his form of LCA at the Children’s Hospital of Philadelphia, Philadelphia, PA, USA. Corey suffers from LCA due to a mutation in both of his copies of the RPE65 gene. Researchers have had promising success in treating this type of LCA. The first clip shows Corey going through an obstacle course with his untreated eye (his treated eye is patched), the second clip shows Corey doing the same obstacle course with his treated eye. At this initial stage, only one eye at a time was treated. Success with this type of treatment for LCA due to mutations in the RPE65 gene has provided proof of concept. Consequently, it is expected that this approach will be applied to many more types of LCA, as well as other inherited retinal diseases, in the coming years. At present, this treatment is available for only one gene. With your help, further ground-breaking research could be funded to provide similar treatments to other types of LCA and other retinal conditions.